On a tip from Paper and String, I ambled into Kava Café in the Far West Village one morning after Snowpocalypse Part 8,031. 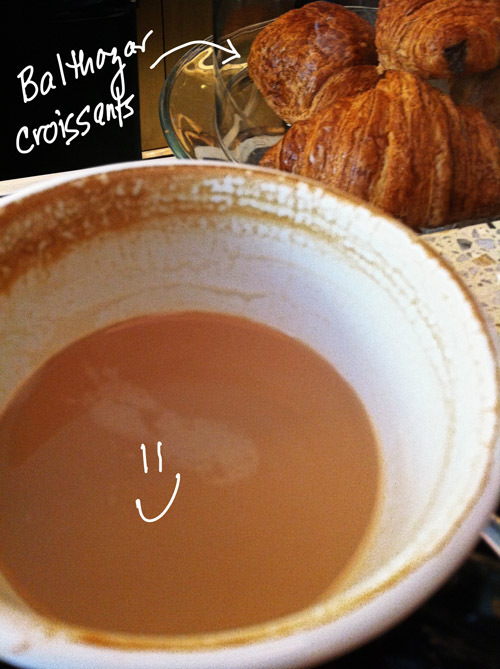 I was in search of some good, strong, snow-melting coffee. 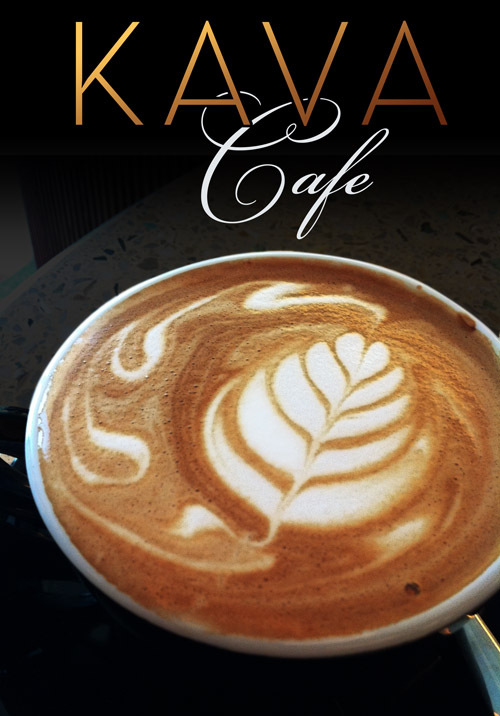 I was immediately greeted by Christian and Frank, two of Kava’s knowledgeable and friendly barristas, dressed in matching black fedoras and skinny ties with crisp white oxford shirts. Christian, a coffee-brewing artisan, demonstrated the power and beauty of their La Marzocco espresso machine, a nine-gage (or speed), Ferrari-caliber engine that controls flavor and strength. Christian served me a latte adorned with an elaborate milk-swirled leaf – almost too pretty to drink. Almost. As I sipped away at my cup of drinkable velvet – the perfect caffeinated balance of bitter and smooth with just a touch of froth – I was introduced to owner John Saric. John explained some additions to eagerly anticipate at Kava, including a beer and wine selection, flavor profile-based coffee tastings (like wine flights just with coffee) curated by Christian, a gelato machine (internal, mental squeals on my part), and expanding the food menu (right now they offer a selection of Balthazar pastries and a panini menu). I stood at the walk-up bar (stools are forthcoming, but I appreciated the European flair of the standing bar) and watched as customers sauntered in, chatting with the barristas, John and among themselves. Open only about two weeks, Kava already has a loyal band of regulars. They can now count me among them. Check out the feature article in the New York Times Magazine here. As Thanksgiving approaches, it has occurred to us, that while many of you may love food, maybe not all of you cook. Or bake. So we are taking it upon ourselves to help you find excellent food (in this case desserts) that other people have made for you. Now, make no mistake: this is not food that is runner-up to home-cooked/baked fare. In fact, this IS home cooked/baked fare – it’s just been done by someone else. And it’s better than your grandma makes. Seriously. And I have nothing against your grandma, she’s a lovely woman. Tell her I said hi. First up is Van Leeuwen Artisan Ice Cream. You may remember that they’ve been featured here before. Well, they are back. 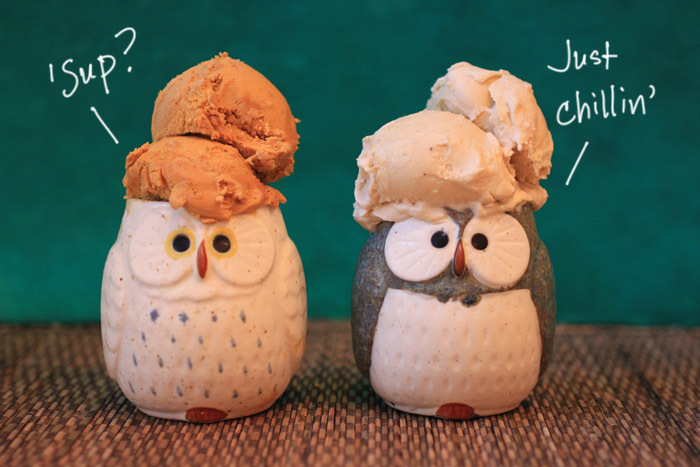 And for good reason: SEASONAL ICE CREAM FLAVORS. That’s right. In this case, the flavors are Pumpkin and Eggnog. These ice creams are just what you would want after your Turkey dinner to go with that Pumpkin Bread Pudding or Apple Pie (recipes forthcoming later this week). And they are mighty nice by themselves too. 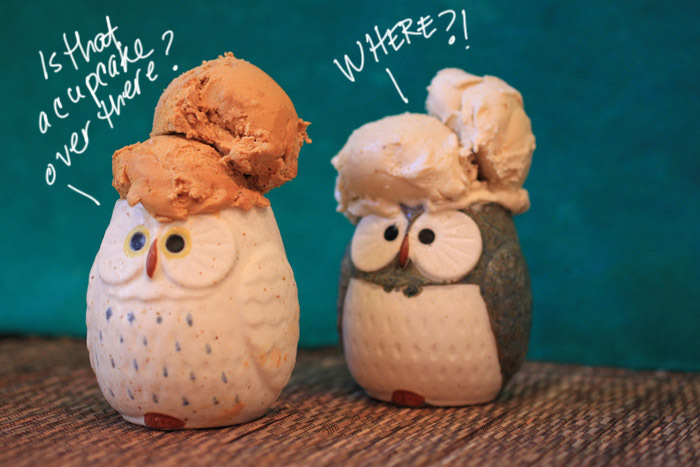 I should know, as both flavors barely survived this owl-themed photoshoot because I was eating them as I photographed. Not super-productive, but very, very tasty. The pumpkin flavor, tastes exactly like the filling of the creamiest pumpkin pie, and the eggnog flavor is WAY better than real eggnog. It’s got a hint of that nog punch (I think the technical term for this is “nutmeg”) and something else (whisky?) whipped into a frenzy of deliciousness. You will want to eat it all the time. For those of you that want a little cake with your ice cream (and who could blame you?) or just some cake, I have the perfect Thanksgiving cupcake treat: a pumpkin spice cupcake from City Cakes in NYC. I can’t say enough about the moistness of the cake part of this cupcake. I really hate it when I bite into a cupcake and the thing crumbles in my hands. If all I wanted was a vehicle for frosting (and I’m not saying there’s anything wrong with that) then I would just eat frosting with a spoon. But I want the whole package. I love cake. Good cake. And I love pumpkin flavor. 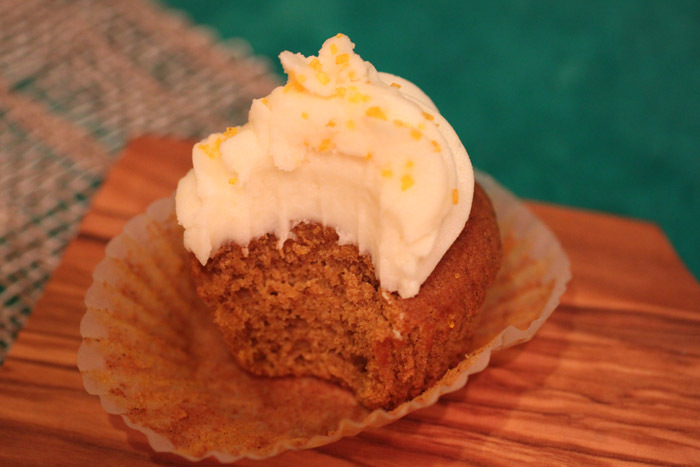 City Cakes puts these two loves together for me in this fabulous little cupcake with a cream cheese frosting that is the perfect complement to the spice of the pumpkin cake. When I got the cupcake (OK, I got four) from City Cakes, I thought, hey, I’ll just have a bite. Yeah, right. I downed that thing like someone was threatening to take it away from me. And so will your Thanksgiving guests. So if you’re looking for a dessert that will make your guests happy, or at least keep you out of the kitchen so you can referee the shouting matches between Aunt Emily and Aunt Olga at the dinner table, check out Van Leeuwen and City Cakes. * Both wonderful companies have many, many more flavors than the ones I’ve spoken about here. So check those out too! Pints of the seasonal ice cream flavors from Van Leeuwen are available only in the trucks. You can find out what part of the city the trucks are zooming around by following them on Twitter. 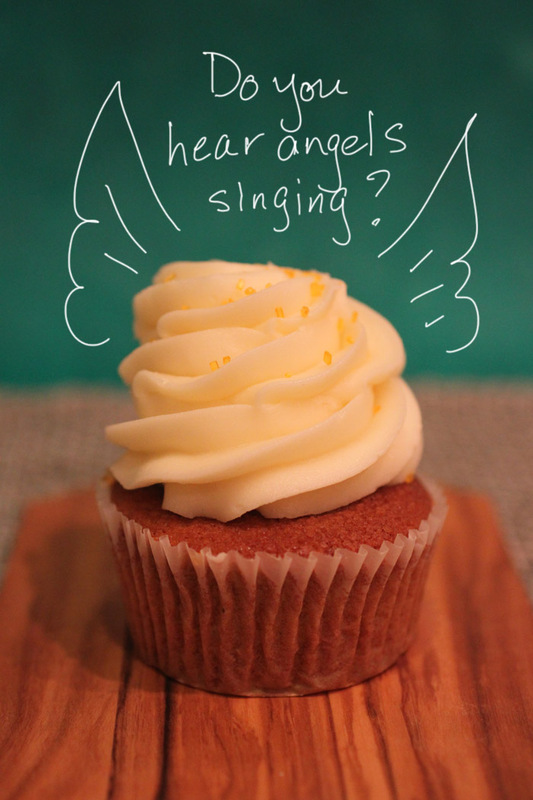 ** You might want to follow City Cakes too while you’re at it – they announce flavors and specials via Twitter.